Pakistani President Pervez Musharraf is under growing U.S. pressure to crack down on militants along the border with Afghanistan. The Pakistani leader is under considerable pressure at home, too, where his support is dwindling and violence is on the rise. President Bush said Musharraf, his embattled war-on-terror partner, must hold free presidential elections, share intelligence and take "swift action" against terrorist leaders pinpointed in his country. Aware of both Musharraf's fragile status and his value to Washington as an anti-terror ally, Bush dodged talking about unilateral U.S. military action inside Pakistan in favor of stressing U.S.-Pakistani cooperation during a news conference Thursday. At the same time, Bush took the rare step of telegraphing some of the demands he has made in private to Musharraf: "full cooperation in sharing intelligence," "swift action taken if there's actionable intelligence on high-value targets," and "a free and fair election." 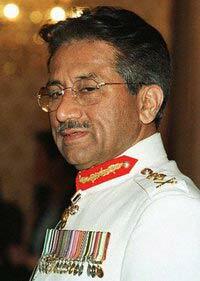 Musharraf, an army general, seized power in a bloodless 1999 coup and pledged to quickly restore democracy. Critics oppose his plan to seek a new five-year presidential term from outgoing lawmakers and his continued holding of the dual posts of president and chief of the military.